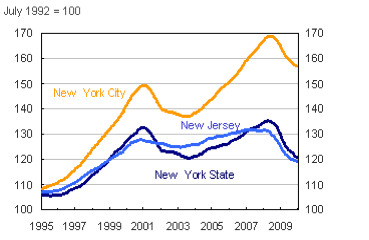 Our Indexes of Coincident Economic Indicators (CEI) for January show a slight uptick in economic activity in New York State and New York City, but a continued decline in activity in New Jersey. The CEIs have been revised based on the recently rebenchmarked employment data. The revisions show the declines in activity in 2009 were somewhat steeper than we previously reported. In addition, we now use a more formal approach (the Bry-Boschan algorithm) to date peaks and troughs in economic activity as measured by the CEIs.